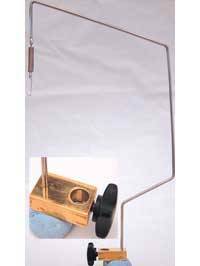 Bobbin holder with wide tube for thick floss and threads. Vice attachment for tying parachute hackles. 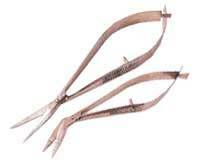 Hackle plier which grips the hackle with a rotatable handle enabling you to hackle flies easily. A long nose hackle plier with a specially moulded rubber tip on both tips to avoid cutting delicate hackles and to aid the gripping of hackles. Fine pointed tweezers, useful for those hard to pick up items. Same as the English Hackle Plier but with super small head for very small hackles. Angled open frame spring scissors, with fine sharp blades. 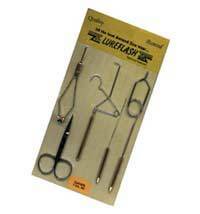 The dubbing spinner is certainly one of the most useful fly tying tools today. The long handle on this turbo version makes for easier turning. Popular model scissors with sharpe blades and large finger holes. New shape aerodynamic dubbing spinner. Wires turned at 900 to the standard dubbing spinner claimed by some professionals to be far superior to standard spinners. Straight scissors with fine point and large finger holes. 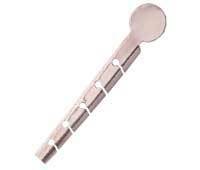 A neat and convenient to use needle with a handle to prick out dubbing or apply varnish. Hexagonal handle to save it rolling on the bench. Useful tool for finishing the head of a fly. Slip over the head of the fly to hold the hackles out of the way when applying varnish. As pictured. Kit containing one pair of scissors, one English Hackle Plier, one Dubbing Needle, one Whip Finish Tool, one Spigot Bobbin Holder and one Bobbin Threader.